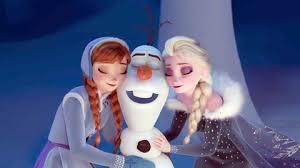 “Olaf’s Frozen Adventure” snows and blows! Hope you’re enjoying your Thanksgiving holiday with your families and friends because this year, Christmas season is here. A long, less-applauded pleasure for holiday nearly-twenty-minute short film as a pre-Coco show to spread the joyous holiday season of the year. Although, there are several criticisms beyond the release in theaters, particular the readings and news over the complaints and issues happening in the Mexico release in theaters. Originally, it was planned as a holiday special on television before it was chosen to showcase it in front a feature film. In this short film, Olaf the snowman (voiced by Josh Gad) was on the verge of celebrating the holiday for the first time, but hope is lost when the sisters, Anna and Elsa, realized they have no family traditions and it’s up to Olaf to search for traditions all over town to bring the holiday cheery-spirits to the sisters. Let me say this, it wasn’t a bad film regardless of the negative responses but it was somewhat a bad idea for Disney to place this in front Disney-Pixar’s Coco. I would think it was okay and pretty decent when it comes to short films. The time length is what increases the issue for angry audiences who really looking forward to see the heart-stringing Coco film. It’s not really a short film but maybe as a “short test.” I was surprised when I saw Coco, it didn’t showed the short film to the early audiences and critics (mainly). It may be due to time length. That was a roadkill and maybe a trip to awful-land or promise-land as Disney would have a decision to screen this, thought Disney did said it was for a limited-time, not all the time. I would called it a “staircase” to the upcoming Frozen sequel as many people found it easier to be “marketed” for the upcoming sequel. It was a “reverse payment” for Pixar’s Tokyo Mater when it was screened in front of Disney’s Bolt back in 2008. Looks like the short have lost its magic and the icy moments are about to worn off and melt. However, the only things I like about the short was the holiday song, the returning cast, and the holiday tradition that connects and ties together for this and Pixar’s Coco, which is based on the Day-Of-The-Dead holiday. I really loved how these gifts that kept on giving for entertainment. It was the first time a non-Pixar short was shown in front of a Pixar film. If Pixar doesn’t have a short film to be released beforehand, then their tradition will be nontraditional. This short is like the “absence of new Pixar short” since there is no Pixar short being produced for Coco. To add a few bonus points for this short, love the fruitcake joke as it seems to be reality check since it was unpopular in the real world. Overall, this short film was ok, but I think the world is better off of seeing Coco rather than this before the film or seeing this on television or as a special feature on Blu-ray/DVD copy of Coco (if there is). This isn’t my first time writing a negative review of the animated shorts but the time issue and character adjustments have just prevented this short from receiving a positive reaction. Not to be negative, but time was always the issue. The rise of franchises (Frozen, Thor, Star Wars, etc.) seems to have gotten out-of-hands. The time length is 21 minutes while Coco is 109 minutes.